Love it or hate it, this stadium is the most unique one among France’s host list! Designed completely unlike any other, it’s the only one to be built in France by Herzog & de Meuron. Matmut Atlantique, of Stade de Bordeaux for the duration of Euro 2016, made waves last year as it was opened to both praise and criticism. 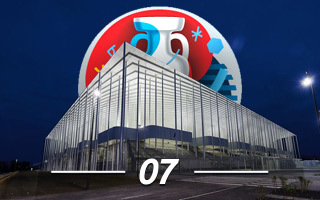 Now we welcome the building as host of Europe’s largest football event. Bordeaux is the dominant football hub of France’s west coast. No wonder it was included in the 1998 World Cup, but already at that point the good old Lescure (Stade Chaban Delmas) was more old than good. It’s been clear for years that a new facility should be built and selection of France to host Euro 2016 worked as a catalyst. Far from the spiritual home of Girondins, the stadium was located in northern Bordeaux. Built from scratch in order to host the UEFA tournament, the building consumed €183 million. Numerous entities took part in the financing plan. On behalf of the taxpayers those were the federal budget (€28m), the Aquitaine region (€15m), agglomeration of Bordeaux (€15m) and the municipality (€17m). Anchor tenants Girondins paid €20 million upfront and are obliged to annually pay €3.75m in lease. Also the municipality is expected to help cover costs during first 30 years, which was widely criticized by local opposition. On site first works began in late 2012, but official cornerstone mounting took place in April 2013. Since then it took exactly 2 years to deliver, the building was handed over as planned on April 30, 2015. The building is based in northern Bordeaux, almost 7km (over 4 miles) from the old town. The Du Lac district, named after local lake, is an event hub with velodrome and exposition center, now further boosted by international-standard stadium. with a tramway terminal just beside the stadium, it’s easy to reach from across the city. Architecturally it’s an absolutely unique work by the Swiss team of Hearzog & de Meuron. Despite thousands of ideas already being in use worldwide, they still managed to create a stadium unlike any other. Planned for a location like this (flat, unoccupied, with woodlands around), the stadium is at the same time monumental and seems very light. With no solid façade separating fans from the environment, even after having entered the stadium supporters may feel like in a semi-open space. The main promenade with concession stands, toilets and seats for the disabled is practically outside the stadium, separated from its surroundings by only a “ribbon” of kiosks. Even more, from nearly every point of the promenade, around the entire stadium, fans may see the field. As many of you know by now, the stadium was selected as Stadium of the Year 2015 by the Jury and took second place in the public vote. Which speaks volumes about the interest it generates. There are 60 skyboxes distributed equally between east and west stands, all located in the lower ring of seating. There are two solid tiers with a clean and simple design, accommodating 42,000 people (UEFA Euro 2016 capacity and regular one are almost identical). When empty, the stadium seems almost sterile. Though very well received by the international architectural community, the stadium got some criticism from locals, who didn’t always enjoy its sleek white environment. Combined with distance from the centre and underperforming footballers the first season of Girondins ended with average crowds of 25,088 people per game. Still, enough to secure future use with 30-year deal signed by the club. Demountable stands behind goals assure that professional rugby can also be played here, while extensive infrastructure underneath the stands provides great basis for business events too, not mentioning large concerts.